The Royal Enfield Bullet looks great a with modern parallel twin motor. Should Royal Enfield build a twin and, if so, should the new motor be a V-twin or a parallel twin (like the Interceptor)? Well, ask the man who built one. In this case I don't mean Aniket Vardhan, who combined two Royal Enfield singles to build his V-Twin Musket. Let's ask John Dawes, a Brit who lives in Spain and whose "Trifield" is featured in Sump Magazine. It's a Royal Enfield motorcycle with a parallel twin Triumph Speedmaster motor. That's 865cc (60 horsepower!) in a finished and fueled motorcycle that weighs 100 pounds less than the Triumph. The Speedmaster's unusual 270-degree crank positions its parallel pistons in such a way that they produce a lopping pattern of power pulses akin to those of a V-twin. 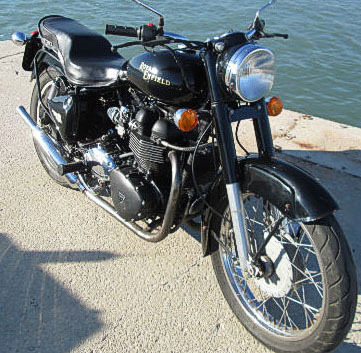 "It's a blast to ride," John commented recently on my item asking what kind of twin Royal Enfield should build. "I say definitely a parallel twin with an offset crank is best; then you can draw on Enfield's history and keep the V-twin guys happy too!" he wrote. Check out the Sump Magazine article for details on how John performed the neat looking transplant. Hi Paul , I had no problem finding the Triumph engine , got it from Pinwall Motorcycles (USA)& it cost me £799 with most of the ancilares. Which was about half whot it would have cost in the UK ! Shipping was free as it came over in the back of a friends 1950s pick up he was importing ! !